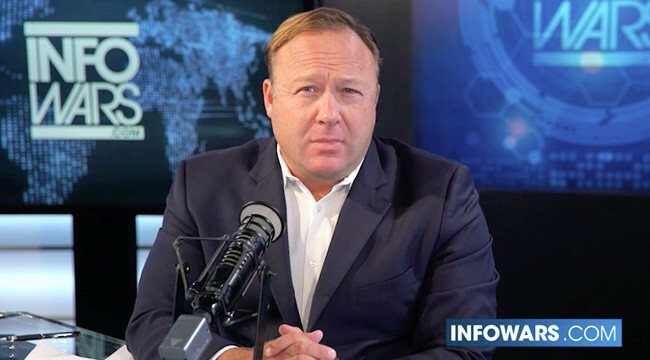 Finally bowing to months (maybe years) of pressure, Spotify and Apple have started removing content produced by noxious alt-right troll Alex Jones. Apple’s removed five of his six podcasts—including his flagship “The Alex Jones Show”—while Facebook has banned four of his pages for hate speech violations. This mass removal follows similar, if less dramatic moves from the likes of YouTube and Spotify, who have removed specific episodes in the past. “Apple does not tolerate hate speech, and we have clear guidelines that creators and developers must follow to ensure we provide a safe environment for all of our users,” an Apple spokesperson said in a statement. Jones is infamous for inflammatory rhetoric that tends to come decked out in a tinfoil hat. His unhinged monologues generally traffic in the bizarrely quixotic but have frequently moved into deranged and downright cruel territory. The most notorious example involves his longstanding stated belief that the 2012 Sandy Hook shootings were faked by the government.